I am really glad to be spending a lot of time reading with Vansh these days. He demands a lot of my time and attention and I am able to do that while feeding Jiya. Even though he wants to read and re-read the same books again and again but like they say 'Repitition is the hallmark of toddler years'. Once he learns something, he enjoys repeating it because he can anticipate what's coming next. 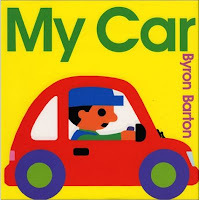 My Car by Byron Barton - Vansh loves this one for its bright, bold illustrations and calls the main character Sam as 'Sam Uncle' who fondly takes care of his chunky little car. He also likes to point to traffic lights saying 'Red means Stop, Green means Go' and likes to read letters of words like 'WALK' , 'SLOW', 'BUS', etc. After his great liking of these two books by the same author, I got a few more for him from the library and hope that he enjoys them just as much. 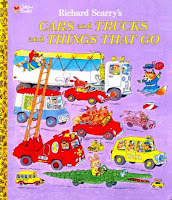 Cars and Trucks and Things That Go by Richard Scarry - I didn't know before just now when I searched for it on Amazon that this one has been around and a favorite for many many years and am not surprised to know that. There are so many vehicles on any one page of the book that Vansh can sit with one page open for almost 3-4 minutes and likes asking me pointing to each one "mummy क्या है ये". He loves to see interesting situations like tomatoes and oranges falling out of trucks; all vehicles crashing with mayhem all around and off late has also started giving sound effects to the same. Well as of now, I really hope and wish for this interest to grow and blossom.